Elvis-a-Rama is a Las Vegas based museum that is dedicated to the King of Rock 'n' Roll. The museum contains the largest private collection of Elvis memorabilia anywhere in the world, which was collected by avid fan and curator, Chris Davidson. From his blue suede shoes to his peacock jump suit made famous during his final Las Vegas performances, Elvis-a-Rama has it all. At Elvis-a-Rama, fans of Elvis are given the opportunity to walk amongst some of his most famous and prized personal possessions, in the town that became his second home. Elvis Aaron Presley was born on January 8th 1935 in East Tupelo, Mississippi. He rose to fame during the 1950's with his Rock 'n' Roll style of music, which was predominantly associated with black musicians. With his quaffed hair, snarling lip, deep voice, and his famous hips, Elvis became a sensation adored by millions worldwide. His career would be full of pits and falls, exits and comebacks, but throughout everything he remained a legendary figure. 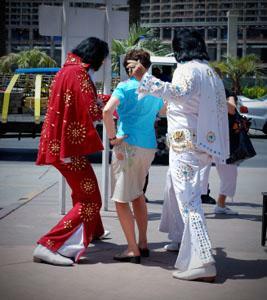 During his final years, the name of Elvis became inextricably linked with Las Vegas. Elvis became a top-billed performer during his years performing in the theaters of the Las Vegas casinos. Elvis Presley died on August 16th 1977 at the age of just 42, in his Memphis home of Graceland. Throughout his life and his untimely death, Elvis created a legacy that will live on forever, a legacy that has been encapsulated in the Elvis-a-Rama museum. The museum, founded two years after The King's death in 1979, is a treasure-trove of Elvis memorabilia and personal belongings. Through a vast array of exhibits and articles, Elvis-a-Rama is a portal to a world of Rock 'n' Roll and extravagance. Items range from Elvis' US army uniform to his incredible vintage Rolls Royce, bought on his return from duty in 1960. The collection boasts literally hundreds of items from throughout his career. Besides the museum at Elvis' home in Graceland, the Elvis-a-Rama museum showcases the largest collection of Elvis' personal belongings anywhere in the world. Some have ventured to estimate the value of this huge collection to be somewhere in the region of $5 million, but for most Elvis fans and for owner Chris Davidson, the items are priceless. The Elvis-a-Rama museum is not simply a walk through building containing exhibits scattered throughout. It is an interactive experience, with videos and live talks by some of Elvis' friends being a common feature. There are also a number of live shows housed within the museum's theatre. These shows range from free, 15-minute demonstrations by Elvis impersonators to two hour-long extravaganzas performed daily. The longer shows cost less than $20 to attend, and a museum/show combo ticket can be purchased for less than $30. Shows performed at the Elvis-a-Rama museum include "The King in Concert: An Exhilarating Show" and "All Shook Up: The Ultimate Tribute." Both are performed by some of the best Elvis impersonators around. "All Shook Up" also guides the audience through the various stages of Elvis' life, from his music to his films and stage shows. Shows are usually performed twice per day, every day of the week, except Sunday. Elvis-a-Rama is located on Industrial Road in Las Vegas, Nevada. Industrial Road is just off Fashion show drive, which is west of the main Las Vegas Boulevard. Guests wishing to get to the museum from the Las Vegas Strip can call the museum for a free ride to the museum.